Thanks for dropping by this site over the last year. And a special thanks to anyone who’s left comments. They’re always very much appreciated. 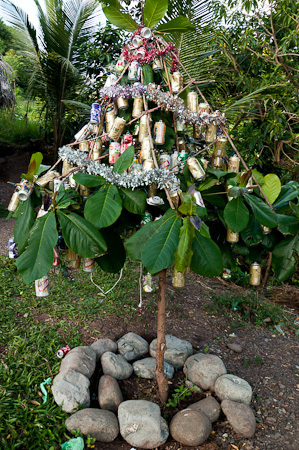 Christmas celebrations (beer and juice cans) on a tropical plant. This entry was posted in Honduras on December 24, 2010 by Cass Gilbert. Hey Cass, just wanted to wish you a Merry Christmas from snow Blighty. I’m back in my parent’s place in Liverpool. We’ve had a bout a foot of snow and have to walk everywhere. Had made it back safe and sound. Hope all is well. Sorry, meant to say Hat (Sombrero) made it back to Britain. Look after yourself. And thanks for gracing these pages with amazing images and stories of the road; you’ve been an inspiration! Merry Christmas Cass from all of us in North Wraxall…looking forward to catching up soon. Excited about Noah’s first Christmas! Merry Chirstmas! I don’t comment often, but your blog is one of my favorites that I read. Keep on taking great photos, communicating the experience and traveling! Happy Christmas Cass, as always, your blog is an inspiration. With the weather here I wish I’d bought a Pug! Still, its fun riding in heavy snow, it doesn’t hurt so much when I fall off…. Merry Christmas and Happy New Year! I wish you all the best for the new year, and I hope you are continuing to have amazing experiences along your journey. Like others who read your blog, I am inspired and in awe. Thanks for the all the time you put into this…I am looking forward to selling my car after my summer job in the Pacific Northwest and backpacking with a bike in Europe! Merry Christmas Cass! Thanks for a great year, both here and on the trails! Keep on keepin’ on! Merry Christmas D-Mc-D! Hope you’re getting excited about the mossie ride… Enjoy it all!